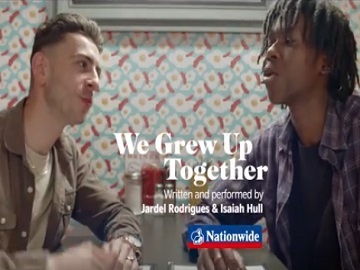 Nationwide Building Society has released a new ad, featuring Jardel Rodrigues and Isaiah Hull reciting a poem about their childhood friendship. The 60-second spot shows the two poets sitting at a table in a dining restaurant and reciting at the same time a poem titled “We Grew Up Together,” which has the following verses: “We grew up together. Different houses, same town. Our mums went to the same antenatal classes. We were born one month apart to the day. Lucky number? 27. Both a two-minute walk from the same chippy. The best Chinese in the city. I get Salt ‘n’ Vinegar. I’m more… salt ‘n’ pepper. But the main thing is… we eat together. We could sleep together forever. He wakes up too early! He never gets his hair wet. And you hate getting your shoes dirty. Remember running for the same bus? In high school? You would always rap while I was drumming on the tables,” the two friends say, reminiscing over their memories together. “We value friendship and reward loyalty. That’s why if a Nationwide member recommends a current account to a friend you both get £100 when they switch,” the British mutual financial institution states. The ad specifies that you’re a member if you have a mortgage, current or savings account and that the offer is only available on FlexPlus, FlexDirect and FlexAccount. In addition, the switch must be completed within 90 days of recommendation and a minimum of two direct debits must be transferred. In another recent campaign, called “Together Against Hate,” Nationwide Building Society has shined a light on the abuse posted online against real people featured in advertisements. The British mutual financial institution has partnered with Channel 4 and brands Maltesers and McCain to show examples of real abuse posted online and highlight that we all should stand up for diversity and inclusion and not tolerate online abuse. In one of the spots included in the campaign, writer and performer from South London SugarJ Poet recites a poem titled “Face to Face” about the importance of face to face interaction in a world where social media impacts everyone’s lives.